Because of the amount of information it contains, and the complexity of that information, BGP Update messages use one of the most complicated structures in all of TCP/IP. The basic structure of the message is described in Table 138, and illustrated in Figure 194. As you can see in that table, several of the fields have their own substructure. The Attribute Type subfield of the Path Attributes field has itself a complex substructure, which I have shown separately in Table 139 to avoid overloading Table 138. 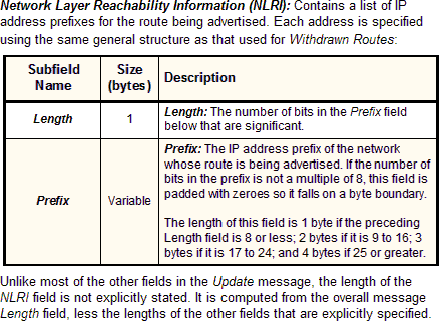 When you examine this format, you may find it confusing that there can be more than one prefix in the NLRI field, given that I just said that an Update message advertises only one route. There is in fact no inconsistency here. A single route may be associated with more than one network; or, to put it another way, multiple networks may have the same path and path attributes. In that case, specifying multiple network prefixes in the same Update is more efficient than generating a new one for each network. 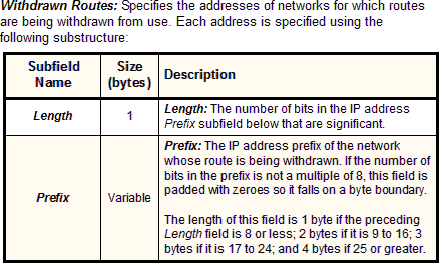 Marker: This large field at the start of each BGP message is used for synchronization and authentication. See the discussion of the BGP general message format for details. Length: The total length of the message in bytes, including the fields of the header. Update messages are variable in length. Type: BGP message type, value is 2 for Update messages. 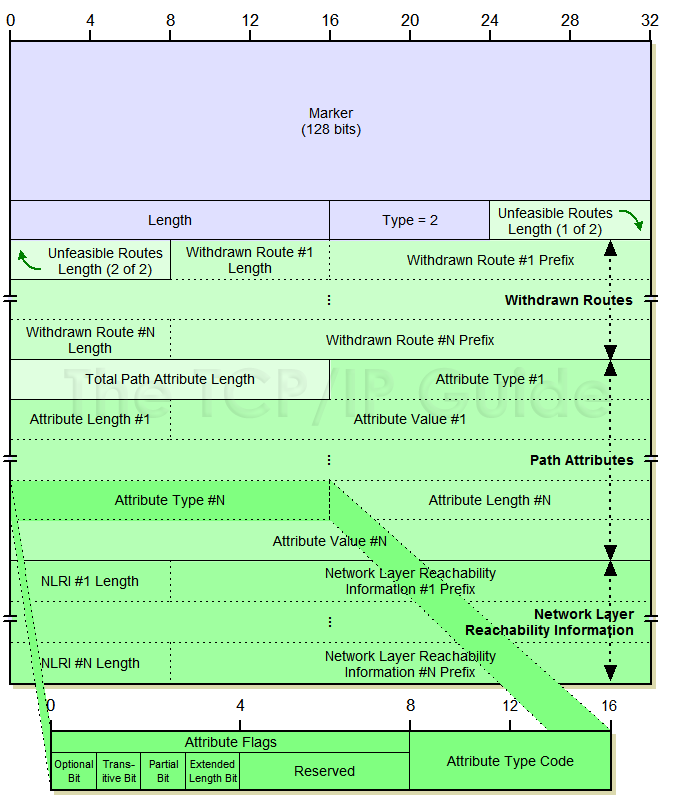 Unfeasible Routes Length: The length of the Withdrawn Routes field, in bytes. If 0, no routes are being withdrawn and the Withdrawn Routes field is omitted. 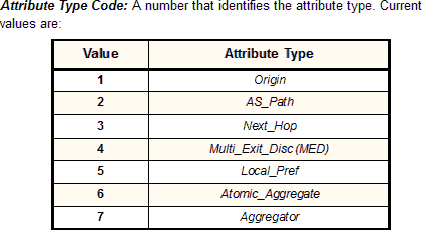 Total Path Attribute Length: The length of the Path Attributes field, in bytes. If 0, indicates no route is being advertised in this message, so Path Attributes and Network Layer Reachability Information are omitted. 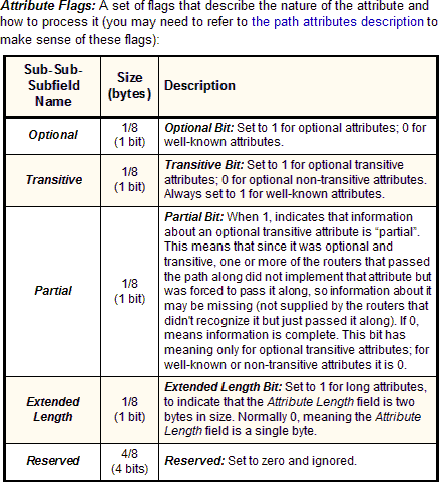 This diagram shows the complete BGP Update message format, including a set of withdrawn routes, path attributes and NLRI entries. 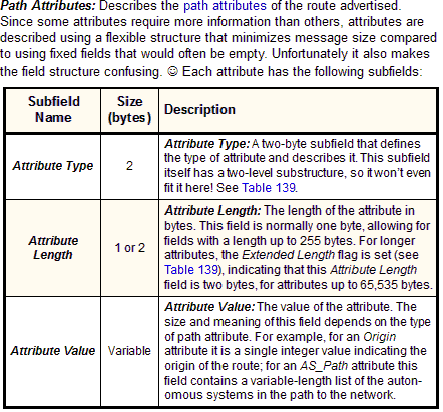 The exploded view shows the substructure of the Attribute Type subfield of Path Attributes, as described in Table 139. Key Concept: The most important message type in BGP is the Update message, which is used to send detailed information about routes between BGP devices. It uses a complex structure that allows a BGP speaker to efficiently specify new routes, update existing ones, and withdraw routes that are no longer valid. Each message may include the full description of one existing route, and may also withdraw from use a list of multiple routes.